The Supreme Court heard an important abortion case this March — and now it's one of the biggest decisions that will be handed down before SCOTUS' current term ends: Whole Women's Health vs. Texas. When they justices heard oral arguments, they seemed about split on whether Texas' new, restrictive abortion law is constitutional. The court's four more liberal justices seemed to imply that the restrictions served no medical purpose and were likely unconstitutional. Justice Kennedy wanted more information. The court's three remaining conservative judges were pretty predictable in their opposition. But when will SCOTUS rule on Whole Women's Health vs. Texas? 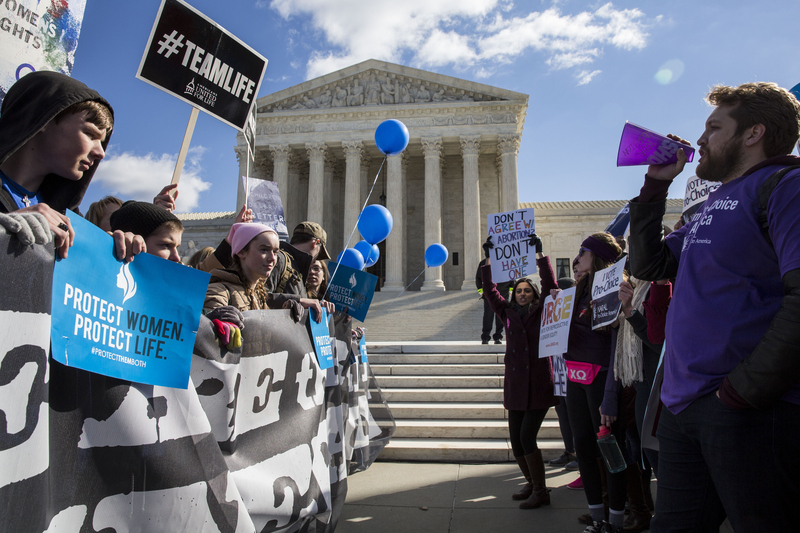 Whatever the justices decide, the court's ruling will likely come at the end of the month. But the decision could come sooner, or as late as early July. All of the court's most important cases are decided along this time frame due to the workings of the court. Last year, if you remember, the decisions on Obamacare, marriage equality, and the lethal injection drugs were all announced within days of each other towards the end of June. That's because SCOTUS releases decisions when they are ready, and oral arguments don't wrap up until April or so. Then there's quite a lot of work to finish. First, one justice is assigned to write the majority opinion. Then once that's done, it's circulated and some justices, especially on a controversial case like Whole Women's Health vs. Texas, dissent. Maybe not to the whole argument, just a part. But either way they pass around briefs for months, adjusting and editing once they have feedback from their colleagues. There's no time limit to finish. Once they're all done, the justices inform the Reporter of Decisions, who prepares the final version and releases it to the public. It's a long process. The more controversial ones tend to take longer. The three decisions released Thursday, on the other hand, were all unanimous. Given the likely split nature of the decision, it's not expected to be among the first. What's at stake in this particular case is huge. The Texas law has two parts that were challenged. One requires doctors to have admitting privileges at a nearby hospital, while the other upped the regulations on the abortion clinics themselves, requiring them to meet the standards for “ambulatory surgical centers." The main question is whether the state has placed "undue burdens on the constitutional right to an abortion," The New York Times reported. Like all of this term's close decisions, the death of Antonin Scalia has complicated matters. If there were a tie, the Appeals Court ruling would stand. That would mean the implementation of the law. Justice Kennedy also voiced the idea of sending the case back to the lower courts for more information to be gathered. He joined the court's liberal wing in placing the stay that has kept the Texas law from being implemented. Nonetheless, about half of Texas' abortion clinics have already closed. A final, supportive decision of abortion rights is the only way to protect Texas women's access to safe and legal abortion.